The year is 1929, the tail end of an era that has since been anointed as the “Roaring Twenties”. While that specific descriptor was used to symbolize an overall sea-change that took place within the overall culture of the time, it is a term that can also be applied literally, describing a sound, and overall sensory experience, that was taking hold of the world at that time in an unprecedented fashion. That experience, was driving. The 1920’s were a period of economic boom, with soldiers returning from World War I flush with cash and ready to spend it, and one of the best ways to spend was buying an automobile. This was reflected heavily in the advertising of the time. After surveying just two newspapers from August and September of 1929, I found almost 20 automobile, or automobile related, advertisements. These advertisements were selling a new ideology to the people; independence. A turn away from the more communal modes of traveling that had dominated up until that point, such as railways. This was also reflected in the large amount of public works projects that began springing up all over the country during this time, in an effort to keep up with the ever-increasing amount of cars that were taking to the roads. As we all know, however, this prosperity would be short lived. Tuesday, October 29, 1929, a day that would become known throughout history as “Black Tuesday” arrives, and with it, a new reality for the vast majority of the people of the United States and Canada. The speculative stock bubble had burst, leaving many people with crushing debts they had no way of paying off. As the banks began to call these debts in, many people defaulted on their loans, while those who did not often made a run on the banks, in an effort to withdraw all the money that they could. This combination led to the failure of many banks within the United States, and by the end of the 1930’s approximately 9000 banks had become bankrupt themselves, taking with them approximately 7 billion dollars in assets, a massive number at the time. Thus, the Great Depression began. This period of intense economic depression obviously brought about a change in the collective consciousness of both American and Canadian society. What once was a culture of excess and optimism, became replaced by fear and frugality. 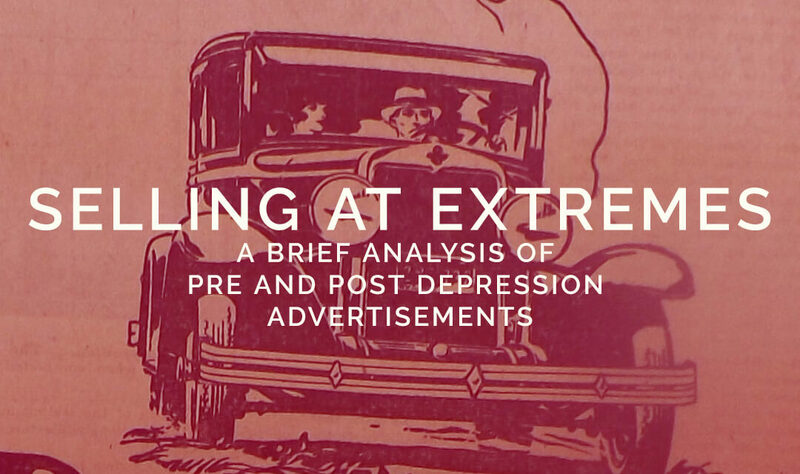 This article will examine pre and post-Depression advertisements from selected newspapers, and analyze some key differences in tone, style, and substance between the two temporal groups, demonstrating the massive cultural shift from boom to bust that took place in such a short amount of time, in this case between 1929 and 1933. Before beginning my analysis of pre and post-depression advertising regarding cars, I would like to spend a little time talking about the other major mode of traveling long-distances during this time: trains. Traditionally railroads had dominated this space, offering a comfortable way to travel across the vast Canadian wilderness. Facing increased competition from the auto industry, railways were forced to advertise to their strengths, as is demonstrated in the two ads that follow. While cars offered the individual freedom to go wherever they chose, there was of course, a price for this freedom. Traveling long distances required a driver to pay attention for a prolonged amount of time, making cross-province travel a time-consuming and tiring affair. It was here that the railways tried to capitalize on their competitive advantages; mainly, comfort and service. 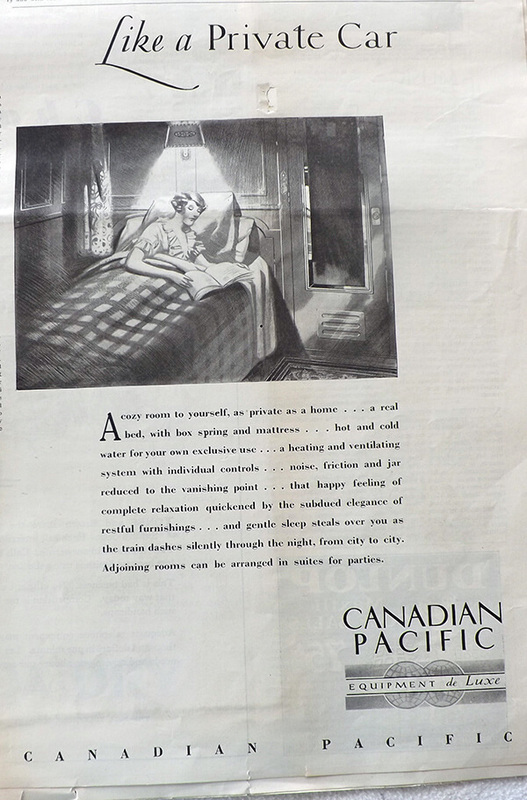 This ad emphasizes the comfort of traveling long distances by rail as opposed to car, pointing out features such as “a real bed […] hot and cold water […] [and] a heating and ventilating system with individual controls” all features that helped differentiate traveling by train from traveling by car at the time. This advertisement is another example of the railway leveraging its position as the most efficient, comfortable way to travel vast distances. 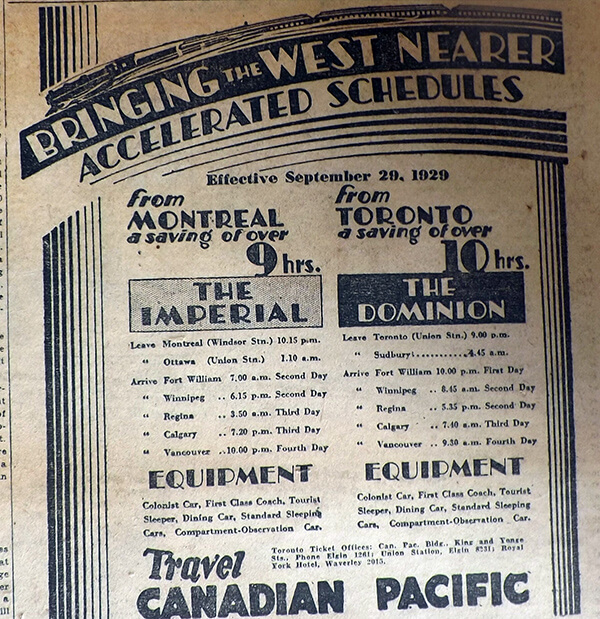 Here the Canadian Pacific Railway claims to save between 9-10 hours from their previous schedules, offering further incentive to potential customers to travel by CPR rail. Ultimately, however, the railway would see itself diminish into the background due to the convenience of cars, but it still retains its niche to this day, offering trans-Canada trips in comfort that cannot be matched by an automobile. For this section of the article, I have surveyed two issues of the 1929 Toronto Star Weekly, the August 31 and September 28 issues respectively, narrowing my focus to automobile advertisements during this time. 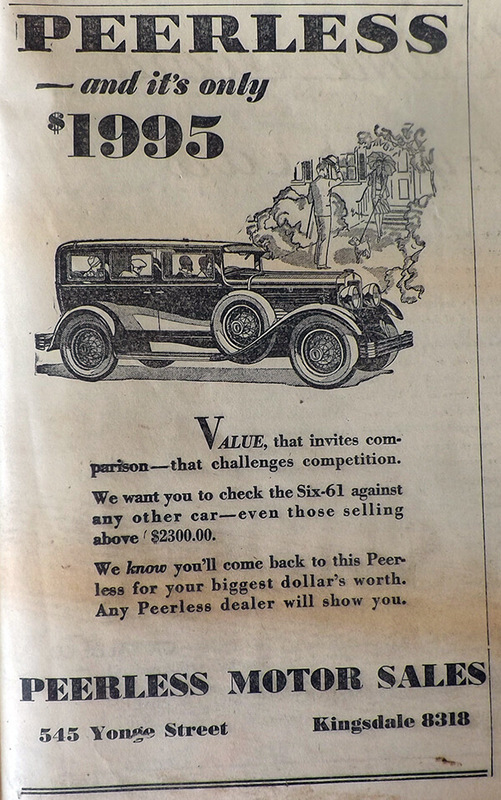 This first advertisement exemplifies the spirit of the 20’s, with the focal point of the ad depicting a luxurious car and well-dressed people, promising “value that invites comparison – that challenges competition”. The price of the car, for the time, is also quite high, equivalent to $27, 249.46 in todays dollars, making it a luxury car. It is telling to note that even at this price the advertisement refers to the value of the car in relation to its competitors. There is also a reference to the car itself being “peerless”, highlighting the spirit of individualism that was prevalent in society at this time. Here again we see an emphasis on luxury, with the car itself set against a backdrop of Romanesque architecture, with an airplane flying above. The advertisement presents a contrast between the old and new, with the Roman architecture recalling a previous age of luxury, while the airplane and automobile represent the arrival of a new era, which, like Rome, would unfortunately soon implode upon itself. The copy of the ad references the “exclusive Durant design”, again, using terms that bring to mind individualism, much like the reference to peerlessness in the preceding ad. The final advertisement from the Roaring Twenties that will be profiled is shown here. From the beginning of the advertisement, we see the individualistic spirit of the 20’s. The ad states “Its all very well to listen to So-and-so’s opinion of car values, but after all, the person whose opinion counts most is YOURSELF.”. We can also see that the car itself is driving alone, on a dusty road obscuring what’s behind it. Much like the 1920’s themselves, the only way to look in this car is forward, towards a future where YOU are in control. As stated above, the Great Depression brought about a vast cultural change in a short amount of time. Gone was the opulence and optimism, replaced instead with financial pragmatism, and a renewed sense of community, with families often helping out wandering workers in search of their next meal. As with every other cultural shift, the advertising changed to reflect the times. The following ads were taken from the 1933 editions of the Palmerston Observer. This ad, when placed next to the preceding Chevrolet ad, shows the extent to which the prevailing cultural attitude had changed from individualism to a more community-oriented mindset. 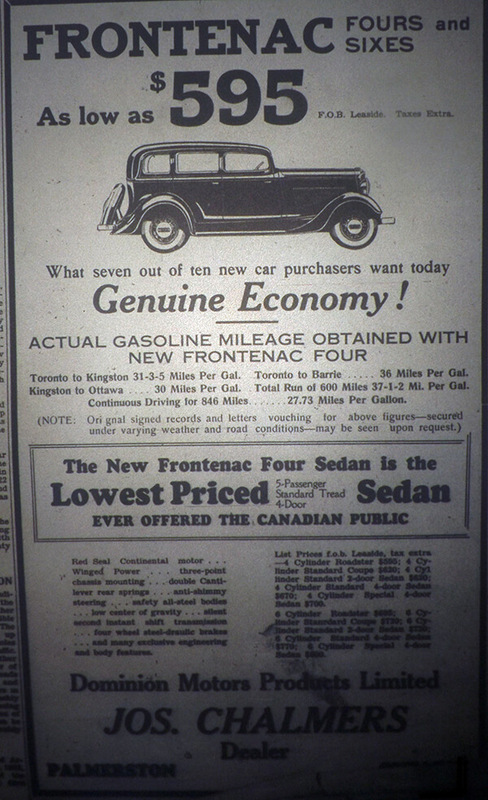 While the Chevrolet ad told you to only listen to yourself, this ad, for the Frontenac automobiles uses consensus to sell, stating that “seven out of ten new car purchasers” want “genuine economy” from their automobiles, and makes the fuel economy the centerpiece of the ad, reflecting the harsh financial realities of the time. The Terraplane is an example of a car that was first produced during the Great Depression, and as such, was made to be a product of its time. Thus, one of the main features of the car is its “economical” value, valued equally as much as the more traditional selling points of a car such as its size and power. It is also interesting that the cars resale value is mentioned in the ad, another reminder of the financial times that the car was created in. A car is not a one-transaction purchase. Maintenance can end up costing as much as the car itself, and this was true during the Depression as well. 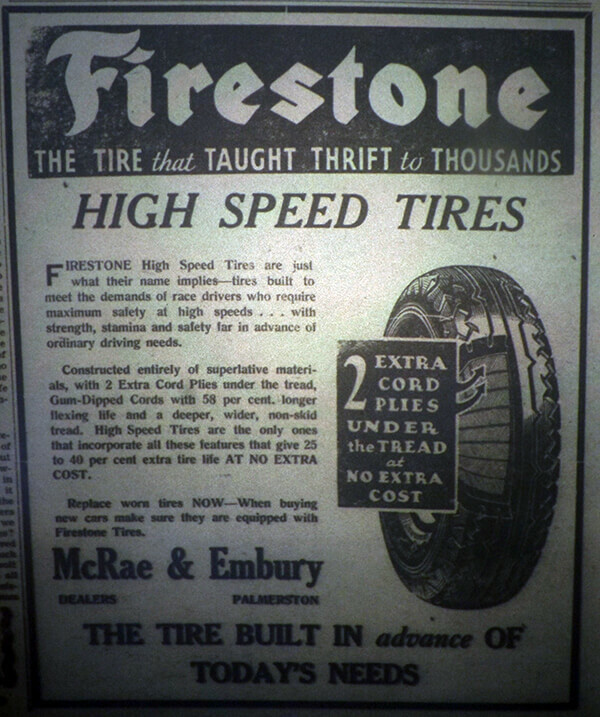 Firestone seems attuned to the times with their slogan, “the tire that taught thrift to thousands”. Longevity is the main selling point of the tire itself, with the claim being made that “High Speed Tires are the only ones that incorporate all the[…] features that give 25 to 40 per cent extra life AT NO EXTRA COST”. Obviously this is a claim that would interest those fortunate enough to still own a car during the depression, who would still likely be feeling the financial pinch. So what conclusions can be drawn from studying ads such as these? Speaking broadly, we can see a shift in attitudes from fetishising wealth and excess during the Roaring Twenties, to a return to the belief that value is king. This belief in thrift is still prevalent today, as the financial crisis of 2008 brought back uncomfortable memories of the seemingly endless depression of the 1930’s. It also becomes evident that advertising plays a large part in reinforcing cultural narratives, acting as a kind of echo chamber for the views of society as a whole. When people have money, the advertising generally reflects this, marketing visions of wealth and splendour. Then, when events like the Great Depression happen, the tone changes, with advertisers appealing to peoples thriftiness. You can’t sell a depression, but you can sell savings.